War and fashion. A battlefield and a product. They both seem unrelated, but they are inseparably connected by an ironic and deep relationship. It's easy to understand if we think of how many clothes and products that we call "standards" or "masterpieces," are closely related to war and the battlefield; a trench coat, a field jacket, aviator sunglasses, a military watch, or even an EMECO chair made of aluminum alloy and a RIMOWA light-weight suitcase. The number continues to rise if we count an EAMES chair, which wouldn't have been created without the development of molded plywood for medical splints and stretchers used in the battlefield, or a Volkswagen Beetle, which was developed for Hitler as a tool to win the hearts of people. As innovative weapons and equipment, military clothing and products are made functional for use in battle situations, and even the location of a pocket is perfectly placed because these products may determine the outcome of the war and affect the precious lives of the soldiers. 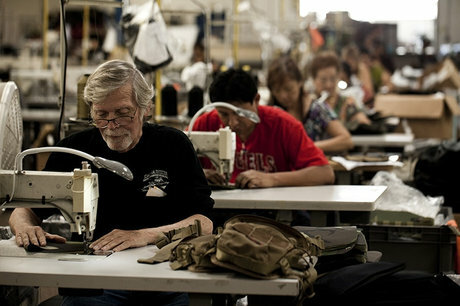 For that very reason, factories with high-standards and talented people were called upon to design and develop such clothing and products during wartime, and even the cold war; these factories and designers devoted every minute to their jobs, regardless of the cost it required. They sought the best material to make the ultimate tools, design the best form and took care of every single detail, in order to win the war. There was no room for ambiguous elements such as the creators' emotional attachment or imagination. 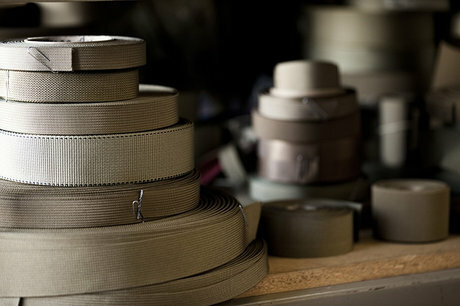 The same can be said for uniforms and outdoor clothing and products; but it's inevitable that military clothing and products have the finest form and detail because they are made from the ardent pursuit of function and utility as a pure tool, which are totally unrelated to a designer's creativity or trend. While many innocent people were deprived of their lives by war, it is often said that as a result of war, there were many achievements when seen from the viewpoint of the history of fashion and products. Regardless of whether or not they are bellicose, many men are often fascinated with military uniforms and firearms, or the term "MIL-SPEC" because they represent the ideal form of clothing and tools. Military clothing and products developed during war inspire many creators, and they try to use these ideas in their work as they feel an irresistible magnetic power in their functional beauty. These products of war now appear in various guises while we go about our peaceful and comfortable lives, in the form of cars, tools, and fashion. Regarding fashion, military items like trench coats, M65 field jackets, chino pants and 6-pocket pants are constantly updated and introduced within a new area called "town use," using new materials or making changes to their pattern and details. Since the 1980's, bags made of ballistic nylon and those inspired by the MA-1 flight jacket have existed in the market of fashion. Ballistic nylon was originally developed for bulletproof vests, so these bags were obviously inspired by military products. BRIEFING is also one such brand. A Japanese brand developed by SELLTS LIMITED in 1998, all its products being made completely in the USA. Taking advantage of being a late starter, they successfully introduced an out-and-out militarism in their craftsmanship, which is distinct from that of precursors. 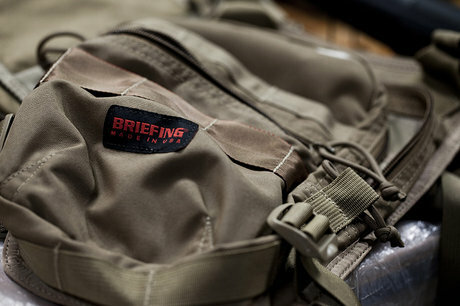 The peculiarity of BRIEFING is that their products are designed in Japan and made in the USA; and they asked a military bag factory to undertake production from the very beginning, a factory which made military and special bags for the US Army, police and hospitals. Not only that, BRIEFING remains stubbornly authentic. It uses ballistic nylon (very sturdy ballistic nylon of 1050 deniers, woven with a special double basket weave; the fiber has self-restoring power even if a small hole is made with an ice pick); DuPont's CORDURA nylon (now a registered trademark of INVISTA), known as a military material said to have a durability 7 times higher than that of regular nylon; the Red Line applied on nylon tape and joint tape for reinforcement and visual confirmation that conforms to MIL-SPEC ; and metal parts with a baked coating to prevent reflections that could be used by enemies to identify your location. In other words, while producing town-use and business bags, BRIEFING's characteristics reside in having a military factory as its production center and the use of textiles, parts and technology that conform to MIL-SPEC, rather than through “essence” by texture or stylish design. If I remember correctly, it was 2002 when I saw a BRIEFING bag for the first time. I'd heard of SELLTS LIMITED in the late 1990's, being impressed by canvas bags and garment bags made as an advertising novelty with the name of a multi-brand shop. They were so well made that I asked the buyer which OEM made them. I then went to an exhibition organized by SELLTS for the first time. Back then, specialty stores, which were carrying BRIEFING bags, still had a low profile. My memory isn't too good, but there is a reason I clearly remember it was in 2002. At the exhibition, BRIEFING bags were inconspicuously displayed in a small corner among other brands, including “Daniel & Bob” (before becoming popular) (SELLTS is the importer) and SELLTS' original brands such as “WRAPS” and “RUGTIME .” Since BRIEFING had just begun and had only 10 models at the most, it was in real need of a promotional campaign. I was surprised to hear the reason (described later) for such a low-key presentation of BRIEFING. As soon as I saw the brand, my professional instinct told me that it would eventually transform and grow, even before I was given the sales talk. The reason was simple: while “Daniel & Bob” needed some time to be recognized by the market due to their limited target groups and higher price range, BRIEFING had a wider target area, straightforward form and an affordable price. Back then, military clothing, symbolized by camouflage items, had just started to be accepted by the general market, which was just another trend in the fashion industry. It was a time when used or real military clothing and products were gradually becoming popular, being modified or redesigned into a modern style. Above all, BRIEFING's authenticity and ‘atmosphere’ were outstanding, compared to the military-style bags of other domestic brands. The only disappointing thing for me was that they only had a black collection, whereas there should have been other color variations, like olive drab, khaki, or camouflage. I was soon convinced, however, by the explanation given by Yuji Nakagawa, President of SELLTS LIMITED. He came over to talk to me while I was standing in front of the BRIEFING section, looking on in admiration, and explained to me the reason why they were hidden in a corner, and only the black collection was currently available. It was because BRIEFING had been just launched, but was practically put out of operation due to the 9.11. incident. An American company called military factory was, at that time, undertaking all production for the BRIEFING brand, but had to use most of its production lines for military equipment ordered by the US military after the war started in Afghanistan under the Bush administration. Small lot orders by private companies like BRIEFING were stopped, making production of BRIEFING bags impossible. No matter how many times SELLTS LIMITED urged them to try by phone or e-mail, Factory said the same thing: they couldn't do it. At one point, they seemed to have completely stopped replying. SELLTS LIMITED continued, however, to display BRIEFING items at exhibitions and even accepted orders under the rather special condition that delivery of the goods would be possible only after production was restarted: and they couldn't promise a delivery date. After all, they had to wait until 2003 to restart production; however, this resulted in providing a strong impression to both buyers and press that BRIEFING goods were really made at an actual military factory catering to the US Army.